Gone With The Fashion: Wedding Guest Pondering..
A lovely wedding invitation landed with a thud (it contained both invite and wedding list and directions!) on the mat yesterday. On the 1st of May my boyfriend's brother and his girlfriend will be tying the knot! at this time of year, and it could be a little on the chillsome side. Secondly, the reception is being held on a boat on the Thames - should I plan an outfit that works well with deck shoes? Or hope the stabilisers on the boat will be better than those on the ferries over to France that I remember from childhood? 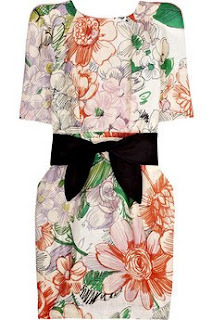 in a world where money was no object I would opt for anything floral from Erdem - Ideally this Floral Print Silk Satin Dress. I'm sure they'd all look tip top with a reflective orange life jacket! guest outfits. Quietly beautiful, demure, ceremony and reception appropriate - oh they're just lovely. Extra points go to the Stella McCartney dress for working with or without tights, weather dependent! Am also looking forward to Topshop and Whistles' Spring Summer dress offerings - but whichever dress is chosen, I think I'll team the winning number with ankle boots to add a little something to what I hope will be a charming little dress and an equally charming day!